Having a pet emergency plan in place for hurricane season is one of the most sensible things you can do as a responsible pet owner. When you hear a hurricane is on its way, you don't get much warning. This causes panic and often you forget what you need to do and forget important things, like your beloved animal or things that can cause you to be turned away from shelters, this is why a pet emergency plan is so important. If you are out of home/station at the time of striking of the disaster you should make arrangements for someone to go to your home immediately and ensure the safety of your dogs. Your pet's disaster supply kit has to be kept in a convenient place inside your house; this kit should contain 3 days' supply of food and water, crate, a first aid kit, can opener, leashes, harnesses, and newspaper or potty pads. 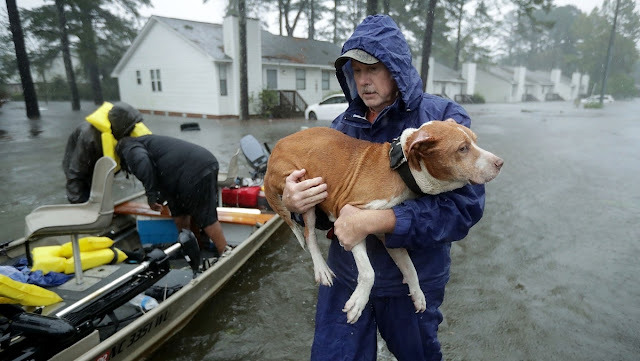 Check out this video so during a hurricane/flooding you will understand your pet’s plight and take your pets to a safe place don't leave them behind because when you return your pets might not be alive.